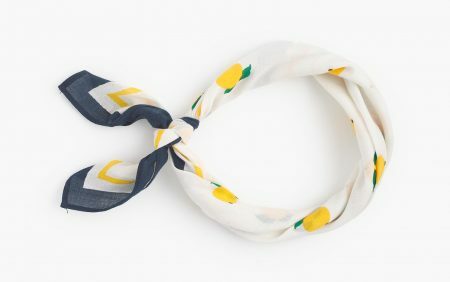 J.Crew Factory is having a Flash Sale today. You can take 35% off with code FLAVORFAVE, online only. I absolutely love the Short-Sleeve Shirtdress, especially the mini-gingham lining it has. I wore it almost immediately after it arrived with my Cons. I also have the Multi-Strand Beaded Necklace in Navy. The clasp is a critter but is hidden by my hair. This Watermelon Tee was almost sold out in-store when I was there a few weeks ago. I find the Jersey Maxi Skirt to be a chic and comfortable part of a travel outfit. Are you shopping this Factory Flash Sale? When I first saw the promo name I read it as ‘Flavor FLave’, in the same voice he says it in. LOL! 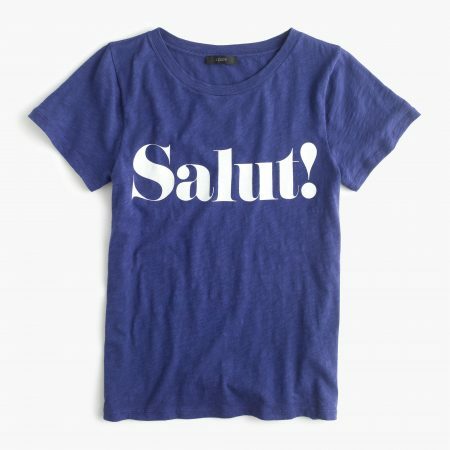 J.Crew will have new arrivals this week and wanted to share some of the faves I’m already in love with! It looks like Lemons are the fruit of the month for May. You can find it in this scarf, a Jackie Cardigan or contrasting Shell. I still have this Banana Republic Lemon Print Skirt so I’m ready for Lemons in May! 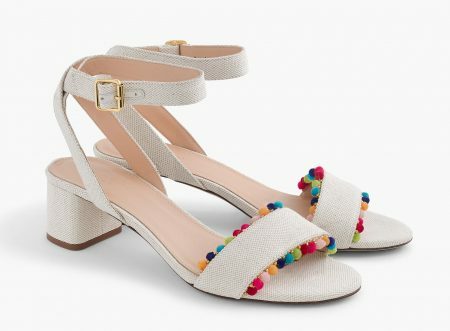 The Lottie Sandals are coming out in Suede, Colorblock and Glitter but I like the Pom Poms the best. The heel is low and manageable too. 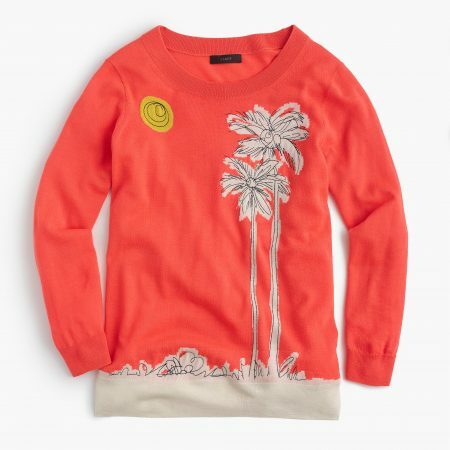 It’s too warm in Summer to wear any type of sweater but I will definitely try to get my use out of this really cute Palm Tree Tippi.  One of the upcoming Style Guide’s images shows this to be purple, but when I check the actual color name, it was Astor Blue. This looks more relaxed than fitted and I ordered a Small in this. There’s also the Made in the Shade Tee and the On Island Time Tee. 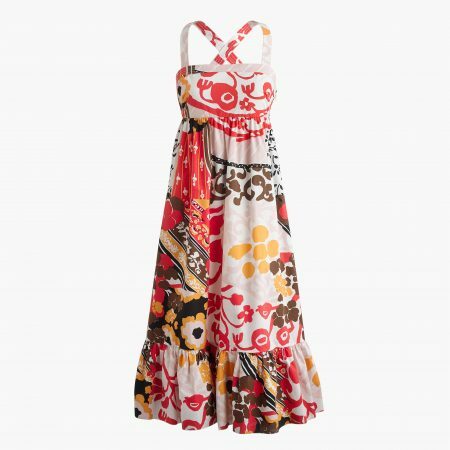 Do you recall the “old school ‘Crew” Talitha Dress? Well, J.Crew has brought back the silhouette in a midi dress. All of these items are included in the HOPTOIT promo of 25% off your purchase. This promo runs through Sunday, so when the new arrivals launch, the promo “should” still be working. I resisted on ordering the Tie-Waist Pant in Madras. I have all the Gazebo Linen Pants from last year that will work for me when I need pants this Summer. I really wanted to love the Ruffle Wrap Skirt in Poplin but it doesn’t seem as “fun” as it did during Fashion Week. Banana Republic is having a Friends & Family offer through Monday. You can take 50% off up to 5 full-priced items with code BRFAMILY. Cardmembers can take an additional 10% off with code BRCARD. There are exclusions with the BRFAMILY code that include sale, BR Picks, cashmere and leather. But everything else is available at 50% off. I ordered the Heritage Wide-Leg Crop Pant. I have the same pant in wool in both Navy and Ivory and have worn both quite a bit through “Winter”. I’m struggling with finding things to wear in my closet that I really love. I know these pants work for me and the gray color is a good neutral to go with tops and shoes. A linen-blend will also be perfect for the Spring transition. I also purchased the Chambray Off-Shoulder Dress. It has the fit-and-flare style I love and it looks like off-the-shoulder is here for another year. I purchased several sandals last year from J.Crew that should spice up the chambray. Happy Shopping! And don’t forget to use Ebates before placing your order or shopping in-store! Banana Republic is having a rare and fantastic promo through Monday, February 13th. They usually have a 40% off promo every other week but what makes this one so rare is that NOTHING is excluded!! Cashmere, Leather and Suede are all included and there’s no code needed but you do need to reach $200. Just add your item to the basket and once you reach $200 the 40% off will automatically apply! Card members will also receive an additional 15% off with code BRC15. 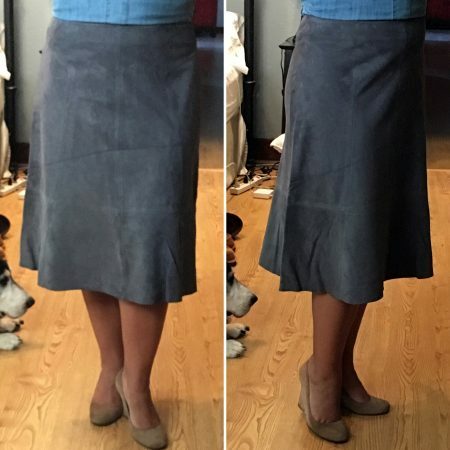 I bought this lovely gray suede A-Line skirt in December when it went on sale and I absolutely love it. The suede is gorgeous and I’ve worn it several times since purchasing. I ended up sizing to a 6 in this skirt. I’m so tempted by this sale to get the Leather Skirt since the suede one worked out so well. I’ll return tomorrow to share more picks and some try-ons from Banana Republic! I love the Double-Breasted Chambray Blazer. It runs TTS and is very lightweight. I’ll share more tomorrow!